Many of us are struggling to get a grip on our financial lives. A lot of us don’t know which accounts have what in them, what bills are due on what days, or what credit cards have the highest balances. Getting a grip on your financial life doesn’t have to be a strain. There are utilities out there that can provide you real time information about your financial picture without having to worry about waiting for statements or miscalculating something in a spreadsheet. The best part about all of this is that these two utilities I am going to introduce to you today is that they are completely free. 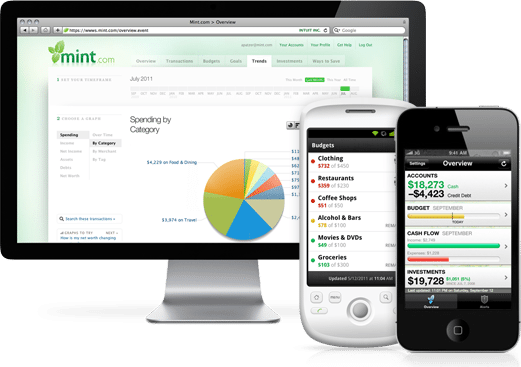 Mint.com is a website created by Intuit that will help you get a grip on your financial picture. If you are unfamiliar with the company, they are the makers of QuickBooks and Quicken. Mint.com will allow you to see all your accounts in one place, this includes your balances and transactions for each account. The service pulls the information in real time from your accounts to give you the most accurate data available. Each transaction is categorized automatically to help you gain an understanding of where your money is going, or coming from. The automatic categorization of transactions is extremely useful, but doesn’t always get the information correct. There are times when you will personally categorize things differently than their system will and Mint.com takes this into consideration by allowing you to change the categories. Loans: Mortgages, personal loans, student loans, etc. Property: Real Estate, vehicles, etc. 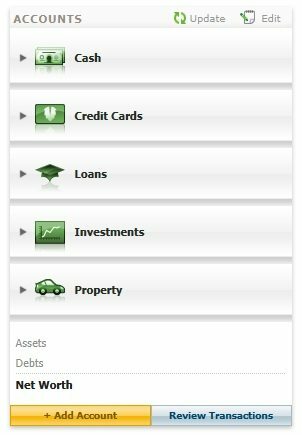 Below your major account categories, it will include your Assets, your Debts, and your total Net Worth. Mint’s overview screen gives you an overall picture of your financial health. The service will give you an alert on spending habits that are out of the norm for you or offer you some updates as to which common bills you have that are coming up. 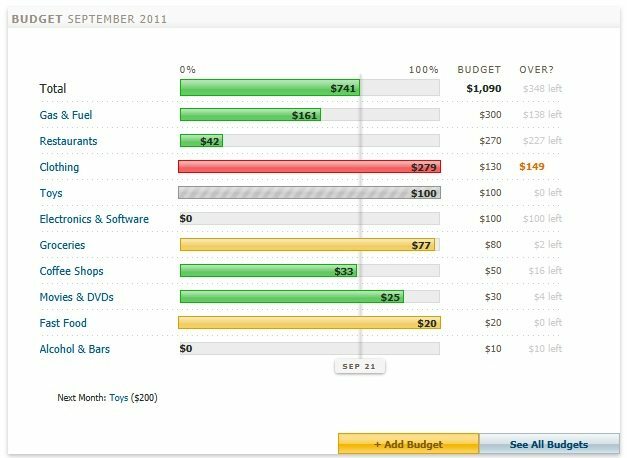 One of the most useful features of Mint is that it allows you to set up Goals and Budgets. Setting up a budget is very easy and by having all of your accounts and transactions categories you can easily see what you are spending and make an informed decision about what you should spend in those categories moving forward. Your budges can be created to reflect a static monthly amount or reflect a rollover budget. A rollover budget means that you allow yourself to spend, for example, $ 100.00 monthly on electronics, but you don’t spend any money this month. The next month you will allow yourself to spend $ 200.00 because $ 100.00 rolled into the next month’s budget. When you have a goal created, it will give you steps you need to complete the goal along with a projected completion date and your progress towards completion. Shown within the goal are ways to help you along. This advice may include things like transferring your credit card balance to a low interest credit card or refinancing your debt with fixed monthly payments. More useful features of Intuit’s free service is that you can track your spending trends by category. 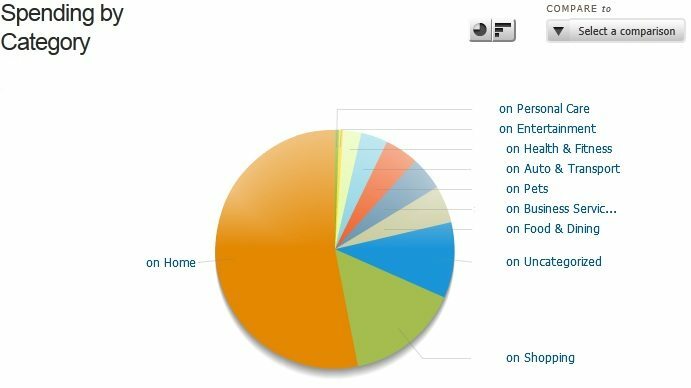 This will give you a nice visual representation of your spending trends and show you what part of the pie is the largest. You can further break this down by merchant, by tag, by assets, debts, etc. This may help you make decisions about transactions that you can control. If you are wondering how Mint.com’s service could be offered for free, the answer to that question can be answered from their “Ways to Save.” Although Mint does not show you any banner advertisement, they do offer a service that will let you shop for credit cards with a lower interest rate, new checking or savings accounts, CD’s, Home Loans, Brokerage, Investment opportunities, and Insurance. Normally, sites would pepper you with this information in so many ways that it inhibits the functionality of the service. Mint’s approach is to offer you these items in an Advice section on their Overview page, or offer them to you as suggestions for your goals. Mint also allows you to manage and view your service on the go with Android and iOS applications for your smartphone or tablet.